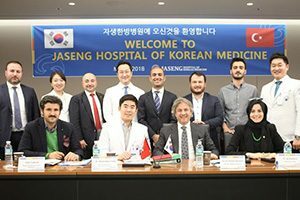 The Global Affairs office works in collaboration with the different divisions at Jaseng to introduce Korean Medicine to outside international organizations. The Global Affairs office aims to develop our research programs and partnerships in international services and broaden our network in the field of healthcare. We are a resource that supports cross-cultural training and oversees and operates various activities for healthcare practitioners interested in integrative medicine. The Global Affairs Office at Jaseng is charged with providing medical practitioners throughout the Jaseng Hospital of Korean Medicine with continuing medical education (CME) that serves to address practice gaps and improve them, thereby enhancing Jaseng’s commitment to the provision of quality medical care that blends the best of Korean Medicine and Western Medicine. As a part of its mission to provide information about Korean Medicine to those physicians and other medical practitioners in other parts of the world, the Office of Global Affairs also is collaborating with other organizations to offer its program of continuing medical education in United States, Mongolia, Russia, Kazakhstan, and the United Arab Emirates. 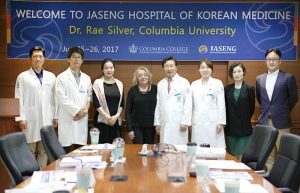 Jaseng Hospital of Korean Medicine is in the process of applying to the prestigious Accreditation Council for Continuing Medical Education (ACCME), based in the United States, to become an accredited provider of CME. Once accredited, Jaseng will be able to certify its educational programs for Category 1 credits from the American Medical Association. The American Medical Association’s Physician’s Recognition Award (AMA PRA) is the gold standard for recognizing lifelong learning by physicians throughout the world. 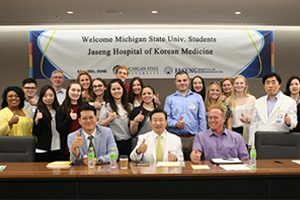 Today, the CME Program at Jaseng includes a comprehensive approach to integrative medicine (IM) through the IM Grand Rounds, workshops, and other training opportunities—for medical students and doctors, and learners attending other annual professional events. The Office of Global Affairs’ program of continuing medical education is overseen by a distinguished Board of CME Advisors. The Board will ensure policies and procedures that are consistent with the criteria and standards of the ACCME and Jaseng, represent the views and needs of the various constituencies of the Jaseng CME Program, and facilitate the expansion of the program throughout Jaseng and its worldwide partners. For more information about the CME Program at the Jaseng Hospital of Korean Medicine, please contact Ji Yun Shin at jasengliaison@gmail.com. Jaseng welcomed a group of visitors from Turkey including officials of Beyoglu district on May 9th 2018. The meeting was arranged by Turkey Ambassador to Korea Ersin Ercin. The purpose of their visit to Jaseng was to tour the hospital facility and to discuss potential collaborative project in the Beyoglu district of Turkey. Followed by watching introductory video and presentation about Jaseng, Mayor Ahmet Misbah Demircan and 8 other visitors had conversations with Dr. Jinho Lee, Executive Hospital Director of Jaseng Hospital of Korean Medicine and medical staff from Jaseng Spine and Joint Research Institute and Jaseng International Clinic on the subject of management, facilities, clinical care and personnel matters. Delegates were impressed by Jaseng’s non-invasive treatments; and they witnessed the effects of treatment as one of the officials of Beyoglu received Jaseng treatment for his neck pain. Jaseng is steadily working toward its goal of globalization and we hope that this meeting acts as one of the stepping stones to our goal. 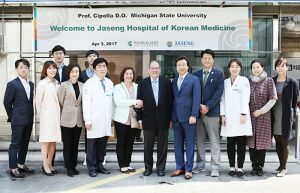 16 Michigan State University (MSU) students with Professor James Dulebohn of School of Human Resources and Labor Relations (HRLR) visited Jaseng last Tuesday (May 9th) as part of their annual tour, “Education Abroad to Korea Summer 2018,” to visit Korea’s major companies, including Jaseng Hospital of Korean Medicine. The event started with introductory meeting, followed by the tour of the hospital facility. Because the students are studying Human Resources and Labor Relations, they had informative conversations with Dr. Joon-shik Shin, Chairman of Jaseng Hospital of Korean Medicine and Jaseng Medical Foundation, on the subject of human resources and his managing experience as a chairman. Jaseng sincerely hope this event provided the students beneficial impact on their future career development! 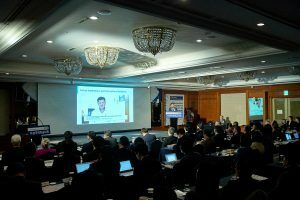 Jaseng’s 1st International Conference provided an opportunity to exchange opinions of domestic and foreign experts on the implications and prospects of the inclusion of Chuna manaul therapy in Korean national health insurance, anticipated to be implemented as of late 2018, and to share the collective knowledge on the achievements in the research of musculoskeletal disease in the field of complementary and integrative treatments.